Colonel and Ginger – update! 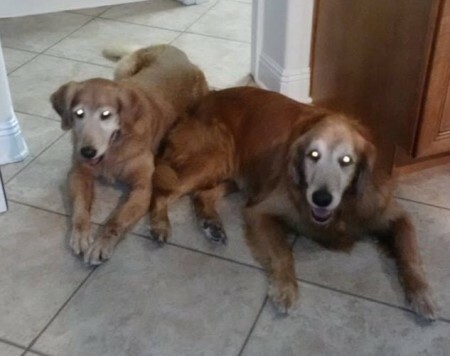 Colonel and Ginger left ECGRR to be in their forever home back in September 2012. Thought I would give you an update on Colonel and Ginger. We adopted them in September 2012. They are doing great and are very much part of the family. Ginger is now 12+ and loves to walk, but really can’t go very far. She is pretty active, but slows down quickly in the evening… Colonel (11) is still very robust and will walk as far as we want to go. ECGRR: Thanks for sharing this with us, Ferd. 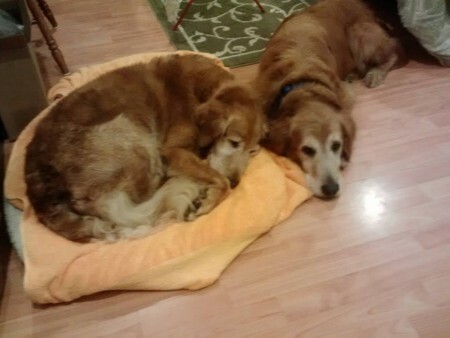 An even bigger thanks for giving these two a wonderful home! Willing to bet the squirrels still pass through the yard very cautiously.